Kissing fish belong to the same family as bettas and paradise fish. Kissing fish or kissing gouramis (Helostoma temmikii) do not belong in the same aquarium as goldfish (Carassius auratus auratus). The water conditions that the two fish species need are too vastly different for them to live together. Even if that weren't so, behavioral and physiological issues make these fish seriously threaten each other when they're in the confines of a home aquarium. Both make fine keeper fish, but only in separate fish tanks. 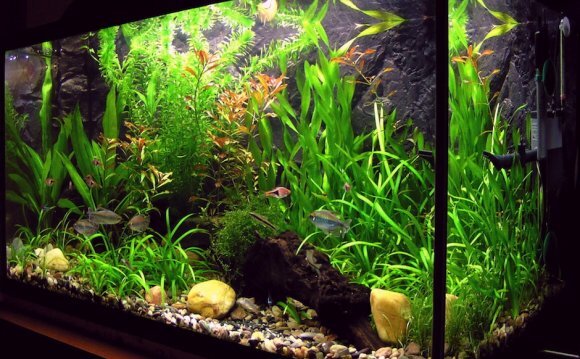 The biggest issue keeping these fish out of the same aquarium is their different temperature requirements. Kissing gouramis come from the tropics, while goldfish come from subtropical and temperate waters. This means that goldfish need water cooler than the low 70 degrees Fahrenheit, while kissing gouramis need water warmer than the low 70s. While each fish can survive at the edge of their ideal temperatures, where there is some overlap, it stresses fish out when their water temperature stays outside of their ideal range. Stress leaves fish vulnerable to disease. The different distributions of these species presents an additional, indirect reason to keep them away from each other. Temperate and tropical fish have adapted to different suites of germs and parasites. This means that kissing gouramis can carry disease that won't harm them but can kill goldfish. The same's true in reverse. Combined with the stress engendered by different temperature preferences, this makes it likely that one species or both will get sick if they share an aquarium. If issues with temperature and disease were not enough to convince you to avoid keeping these fish together, these two species might fight. More accurately, kissing gouramis may pick on goldfish. Kissing gouramis are not ridiculously aggressive - particularly for members of the paradisefish/betta/gourami family - but may occasionally fight with other fish. Many fancy goldfish have long, flowing fins and can't stand up to even a minimal level of aggression without suffering serious injury. Even though goldfish don't have the same territorial instincts that kissing gouramis possess, they do have great enthusiasm at feeding time. Goldfish can crowd out tropical fish during feeding time. And despite their territorial nature, kissing gouramis have relatively small mouths, making it hard for them to feed quickly. If a goldfish and a kissing gourami managed to share an aquarium in the first place, the kissing gourami would struggle to get a share of the food.